Always bathe your Yorkie after he swims to prevent skin irritations. 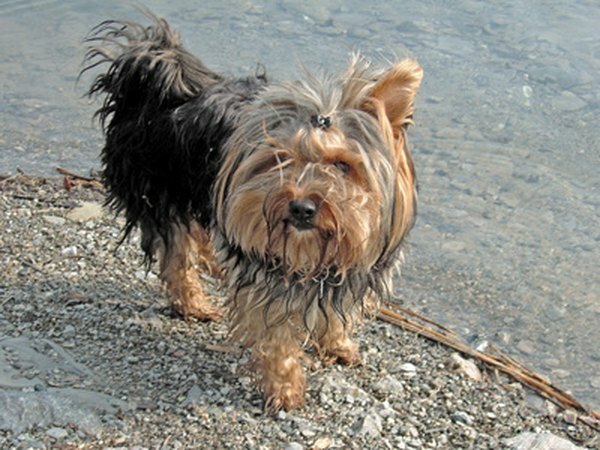 Chronic itching in a Yorkshire terrier can indicate several conditions, most of which are easily treatable. A Yorkie's delicate coat and body make it particularly important to identify the cause promptly before an irritating problem becomes a much larger ordeal for you and your pooch. Fleas can jump 7 inches high, which makes a Yorkie, who's belly is 3 inches off the ground, a walking buffet. Small insects crawling and biting all over your Yorkie will cause him to constantly itch, scratch and nibble his own skin raw. Fleas tend to occupy the genital region, thighs and neck, so check those regions carefully when inspecting for infestations. If your Yorkie is indeed infested, a thorough bath in flea shampoo, followed by a monthly-applied topical preventative, are all that's needed to stop the scratching. Just because your Yorkie ate corn, wheat, milk for several months without incident doesn't mean he can't be allergic to those same ingredients when he's older. Food allergies tend to cause specific areas to itch, including his ears, stomach, hind legs and face. Because Yorkies are small, eating even a small amount of an allergen, such as bit of pizza crust or a tablespoon of milk, can cause extreme itchiness. Speak with your vet about possible elimination diets to determine the allergen and stop the itching. Having just one coat of hair offers your Yorkie's skin little protection from cold, dry winds or frequent baths without conditioner. The skin of healthy Yorkie is soft and slightly pink. Dry skin, however, has scales or dandruff-like flakes, which cause itching and scratching. Always condition your Yorkie's hair after using dog shampoo. Moisturize his hair between full-scale baths by brushing in a leave-in conditioner. Never use human cosmetic products on your Yorkie, as the chemical balance is different for human and dog products, which will lead to severely dry skin. During the colder months, dress your Yorkie in a sweater or jacket when he goes outside to protect his sensitive skin from the arid air. 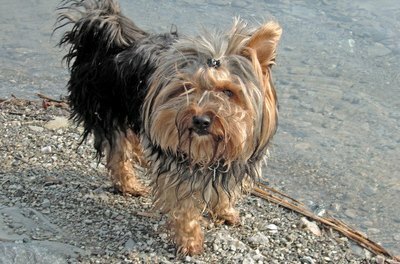 Although Yorkies don't shed, individual strands of hair still die, just like with humans. If you didn't brush or wash your own regularly, all the dead strands would become a storage shelf for dirt, oil and dead skin cells. This buildup leads to poor air circulation around the skin which causes extreme itching. Use a slicker brush to remove your pup's dead hair and skin cells before his bath. Followup with a thorough bath and moisturize his coat afterward with a leave-in conditioner. Take your Yorkie to a professional groomer if you find hardend mats or tangles in his hair.